Day Case Laparoscopic Surgery: How Can We Improve ? INTRODUCTION: The Irish Health Service Reform (DOH&C 2003) focuses on financial, professional and organizational accountability and responsibility. Utilizing more cost effective Day surgery therefore makes for prudent financial management. In the USA and Canada, day surgery accounts for nearly 90% of all surgery performed (Castoro et al. 2007) however in Ireland fewer than 30% of procedures are day cases (PA Consulting Group 2007). A review of the systems and processes already in place is essential. AIM: To determine the efficiency of our Day Case Laparoscopic surgery and identify areas for improvement. 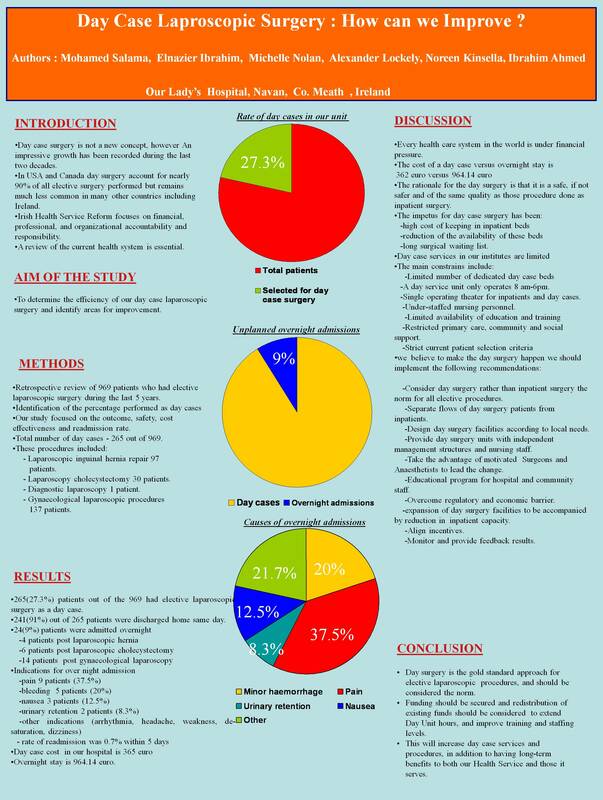 METHODS: A retrospective review of the records of 969 patients who underwent elective laparoscopic surgery during the last 5 years within our institute, to identify the percentage performed as day cases. These procedures included: Laparoscopic inguinal hernia repair (97 Pts. ), laparoscopic cholecystectomy (30 Pts), diagnostic Laparoscopy (1 Pt) and gynaecological laparoscopic procedures (137 Pts). The review would focus on the outcome, safety and cost effectiveness, in addition to the rate of readmission within 2 days, and within 5 days. We could then compare with current standards. DISCUSSION: The cost of a day case versus overnight stay is 362 Euro versus 964 Euro, yet day case laparoscopic surgery represents only 27.3% out of total elective laparoscopic procedures performed. Day case services in our institute are limited. The main constraints include: Limited number of dedicated day case beds, a day services unit that only operates 8am-5pm and a single operating theatre for both in-patient and day cases. Shortages within numbers of nursing staff and limited availability of education and training also contribute. Added to this, restricted primary care, community, and social support systems compound the problem. Furthermore, current patient selection criteria are strict, e.g. BMI and ASA, and could be modified to include a broader patient population. Governmental funding to address these constraints and improve resources and training would ultimately cut costs whilst simultaneously increasing the delivery of a high quality, safe and effective surgical resource. CONCLUSION: Day surgery is the gold standard approach for elective laparoscopic procedures, and should be considered the norm. Funding should be secured and redistribution of existing fund should be considered to extend Day Unit hours, and improve training and staffing levels. This will increase day case services and produce long-term cost benefits to both our Health Service and those it serves.